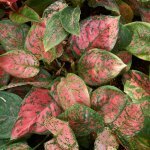 There are many different types of tropical houseplants that anyone can grow indoors year round. Some tropical houseplants are more typical than others. Tropical houseplants will vary in how well they are able to strive in less than optimal environmental conditions. 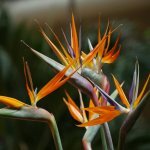 The following list is of tropical houseplants that are able to survive in the less-than-ideal circumstance of being in our homes. The Pothos plant is a vine plant that is also called the Golden Pathos because of the yellow color accent that is often found naturally in their leaves. 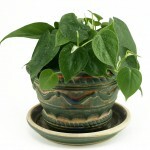 You can tell that you have a Pothos by their heart-shaped leaves and its light green color. 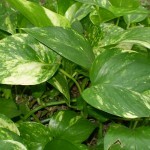 Pothos are great tropical houseplants that anyone can grow because they need very little light to grow. Even an ordinary table lamp gives this plant sufficient light to grow, however, if you can give the plant sunlight by placing it near a window, the coloring in the leaves will be a bit more appealing. Just keep in mind that if you are able to give the Pothos more sunlight you will also have to water it more often. The more sunlight this plant receives, the faster the water will be either consumed by the plant or evaporated so make sure that you water it. Even if you do forget to water it and notice that the leaves turn yellow and start to wilt, it is not too late. 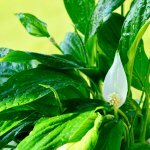 You can bring your Pothos plant back by practicing better watering habits. Pothos can easily be trimmed and re-planted. The more the plant is trimmed the more full it will become. To re-plant more Pothos plants, simply take a stem from the parent plant and root or plant the stem in water. As soon as your Pothos is big enough you can pot it in soil, but Pothos are so resilient they have been known to survive for years in nothing but water. The Silver Queen is the most common variety of the Aglaonema species and is therefore relatively easy to find. The Silver Queen gets its name from the silver with dark green markings that are found on its oval shaped leaves. The Silver Queen is a tropical houseplant that anyone can grow mainly because it is such a forgiving plant. Simply place the plant by a window (it does not matter which direction the window faces) and water it every now and then. You know it is time for watering when the soil gets dried out. The Silver Queen also produces small flowers but it is best to cut off these small blooms as they take nutrients away from the plant itself. Like most other tropical houseplants, the Silver Queen will need to have its leaves cleaned every once in a while to stay looking its best. The Dracaena species of plants are particularly appealing, not just because they are easy to maintain, but because they are so diverse. You can purchase a Dracaena Marginata plant as a starter plant that is only about 4 inches, or you can buy a fully grown 7 foot tall plant. Although the Dracaena Marginata can get to be quite large, it is also a hearty plant. The Dracaena Marginata can be recognized by its red or pink edged, long, thin, green leaves. If by chance the plant is not doing well in your house you can easily rejuvenate the Dracaena Marginata by cutting the stems back to a few inches above the soil. The stem will then produce new healthy shoots. As long as the Dracaena Marginata remains hydrated it will last for a long time. If you are not able to give the Dracaena Marginata the water that it needs, some of the leaves that drop from the plant may do so permanently. If you notice too many leaves dropping from the plant, make sure that you are not letting the soil get too dry. Usually two to three inches of dry soil at the top of the plant means that it is time to re-water it.